Over the last decade, I have made in excess of one thousand Matzoh Balls. We make about one hundred every Passover and enjoy them throughout the year as well. 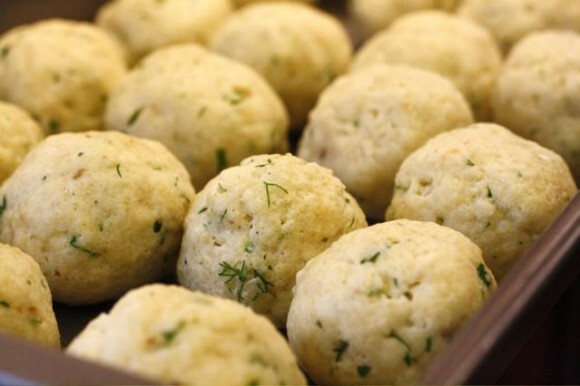 As the self-proclaimed Queen of The Matzoh Ball, with Passover around the corner, I’m sharing my tips on preparing the fluffiest and tastiest of matzoh balls! I use boxed Matzoh Ball Mix which has baking powder in the mix. Or you can use Matzoh Meal and add baking powder and salt. The ingredients in baking powder are generally: Corn Starch, Bicarbonate of Soda, Sodium Aluminum Sulfate, Acid Phosphate of Calcium. Since it contains corn starch (corn cannot be eaten during Passover), a baking powder with this ingredient would not be Kosher for Passover. For the holiday you would need to find a Kosher-for-Passover baking powder usually made with potato starch, or buy a Matzoh Ball Mix that does not include corn starch and is labeled Kosher for Passover. A carton of Matzoh Ball Mix usually contains 2 packets, each 2 1/2 oz. packet makes about 9 balls. Even though we make 100 balls, we do not double the recipe, we make each batch separately ensuring plenty of room for the balls to expand when cooking. We do, however, have several batches cooking on the stove top at once. In a small bowl blend eggs with olive oil. Stir in dill and parsley. Add the contents of one packet and blend with a fork. Chill in refrigerator for 15 minutes. Meanwhile bring a large pot of water to boil (the larger the better). Do not add salt as there is salt in the mix and adding salt to the water makes for very salty balls. Wet your hands and roll chilled batter into balls (slightly smaller than a golf ball). Gently drop the nine balls into the boiling water. Cover tightly, turn down the heat to medium-low. This is one of my secrets: do not turn the heat all the way to simmer. I think with medium-low heat, agitation from the boiling water with lots of room in the pot helps create fluffier balls. And every matzoh ball expert knows, DO NOT OPEN THE LID DURING COOKING, as the steam and pressure also helps make those light airy dumplings. So, as we say, NO PEEKING! Now with this size ball (making about 9 per packet) it will take about 30 minutes to cook all the way through. The boxed mix package says to simmer for 20 minutes, but that is only long enough if you make smaller balls, say 12 per packet, so keep cooking! Now, once thirty minutes has passed, you need to check if the balls are done. Remove one from the pot and cut it in half. The entire center should be light like the outside of the ball, not darker in color. Have you ever been served dense matzoh balls? I suspect that is because the chef did not test the batch before removing from the pot. If the center is not cooked, continue cooking for another five minutes and test again. The testers make great snacks so be sure to make extra when deciding how many balls you need to cook for your party. Remove the fully cooked balls with a slotted spoon and cool in a dish or pan in a single layer. Once room temperature, the balls can be covered tightly and refrigerated over night as we do for Passover. If you are serving matzoh ball soup right then, simply add your balls to a bowl of soup and enjoy. Do not cook your matzoh balls in your chicken soup, as this will give you a murky soup. (My best chicken soup recipe can be found here). Wishing you a wonderful Passover. (Portions of this post are reprinted from last year). I appreciate the tips since I have yet to make matzoh ball soup. I’m glad I’m not the only one who uses the mix! I feel silly sometimes since I know I have all the ingredients, but that’s how my mom and grandma made them so I feel compelled. there are so many things that i do a certain way because thats what my grandma did…. you are not alone! Oh wow, what a great recipe! I can smell the dill from here! You are the matzoh ball queen! They look scrumptious! Happy Passover my friend! Thank you Marie – it’s great to be in Chicago (except for this weather)! I wanna come to your house for Passover! No family here so Not motivated to cook for Passover. I am tempted to try my hand at gefilte fish. I miss my grandma. Hi Janis – maybe net year? Where are you? Thanks for the great description of technique! When you say” good-tasting olive oil”, what do you mean, on a scale of extra-light to extra-virgin? Hi Jim – the best way I can describe what I mean – – an olive oil that tastes good enough to drink? We love California Olive Ranch Extra Virgin. Thanks for visiting. Happy Passover! Great recipe, I love love how you made those balls. Wonderful pictures too! Thanks so much for sharing! This Catholic girl does too!! Nobody makes Matzoh Balls as light fluffy, nor chicken soup as perfect, as our local Jewish Synagogue!! A thousand!!?? Well, I’ll take it from the pro that this is the perfect recipe / procedure. What a great appealing recipe:). Hi Christi – no, I don’t think freezing is a good idea. You can make them a day ahead (or up to two days), let come to room temp, cover well, and refrigerate in a single layer. Let me know how it goes! You are AMAZING. I have been on the search for a full-proof matzoh ball recipe for ages, and this is DELICIOUS. I accidently left the heat on high for the entire time but they ended up puffier, lighter and larger than ever. A complete winner! Hi Aimee-Loren! So nice to hear from you. Not surprised that the boiling water resulted in fluffy matzoh balls. YAY! I hope you are enjoying Passover. Yep, this recipe does work, year after year…we just made another 80 balls! I know this thread had been done for a while, but I wanted to know, if refrigerating overnight, how long do you need to have them out to bring up to room temp before adding them to the soup? thank you! We reheat the big pot of chicken soup and leave it on simmer during the seder. Meanwhile the matzoh balls, which had been refrigerated overnight, are removed from the fridge and sit on the counter, covered. When it is time to serve the food (about 1 1/2 hours later) we turn the soup up to high, add the matzoh balls, and everything is hot and ready to serve in about 10 minutes or so, in the meantime everyone is enjoying matzoh, charoset, and maror, etc. I hope that helps, in the end I think if you bring your soup to a boil, and have left the matzoh balls out for 30 minutes or so, that would work just fine too. Hi there, do you think it is ok to make the matzoh balls 2 days in advance and refrigerate? Thanks so much for these great tips! Yes. Drain, cool to room temp, cover with plastic wrap, refrigerate. 2 days is fine. im so glad I read this. i have always made it in the soup and yep… next day it’s murky! Great tips! Thank you . You’re welcome Joelle. Thanks for stopping by! I am a close friend of cousin Geri. I taught her how to make gefilte fish. We used to make it together but now we each do it in our own homes. It’s not hard at all. We buy our fish at a local market and they grind the fish for us. We use our mixers after adding all the ingredientswhich and let it mix for 20 minutes. Then we make the balls and cook them. Just thought I would ring in. She told me about your blog because she knows I love to cook. Maybe a silly question but how do you warm up balls from fridge to put in soup? You said not to cook in soup. HI Peggy – not silly, thanks for asking. You can heat the cooked matzoh balls in the soup. Add the cooked balls to hot soup in the pot over medium-high heat, then serve when they are hot all the way through the center. This won’t cloud the soup. 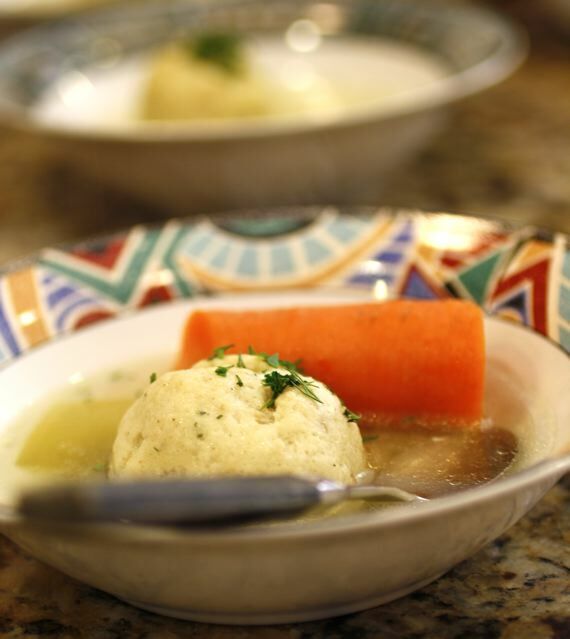 Cooking matzoh balls from scratch in the soup will make the soup cloudy. i have watched and made matzo balls my entire 55 year old life… last pesach i found your recipe. my world is a better place . currently menu planning and remembering your secrets. thank you. Hi Terri – you made my day! Thank you for taking the time out of your busy day to let me know 🙂 Wishing you and yours a wonderful Passover!